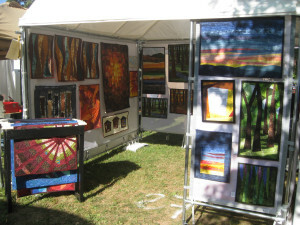 The 45th Eagles Mere Arts and Crafts Festival was FABULOUS this past weekend! This was one of those times that the weather, the customers, and the sales all aligned for a great show. There is no better temperature than 75 degrees with a slight breeze and no precipitation at all for an outdoor summer festival. All of the changes and new things I tried for the first time were huge successes. I used my new desk/pedestal which was a very small footprint so didn’t take away much at all from display space. It was large enough to process orders and wrap up quilts after sales and it stored everything I needed close at hand behind my white pedestal cover. I think one of the best changes was the new way I am displaying price tags. For the last 2 1/2 years I have paper clipped the price to each quilt in the lower right corner. I felt that method distracted from the quilts themselves but I couldn’t think of a different way until a few weeks ago. For this festival the prices tags were hung on white plastic coated paper clips which I modified so they easily hang on my white mesh walls, almost invisible as hangers. The prices were printed clearly on my printer and cut apart then hole punched. 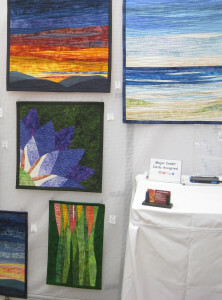 Check out the photos of a close up of one wall with several landscape quilts. They are necessary information but not the focal point anymore. Another significant change was a 3′ wall in the front which I added for more display space. It reduces the size of my canopy opening from 10′ to 7′ which did not seem to discourage anyone from coming in. Rather, the quilts hung on the outside along with my “About the Artist” framed information were marketing lures to potential customers walking by. More often people stopped to read and look then proceeded inside….exactly what I wanted! Finally, I moved the rack of overflow quilts (those I don’t have room for on my walls) to just outside my booth at the corner opposite my new 3′ wall. Again, this was a comfortable place for people to look at quilts, glance into the booth, and I even sold quilts “off the rack”. Next weekend, I am off to Canandaigua, New York for the Art At The Gardens festival at the Sonnenberg Mansion. This is one of the most highly rated arts festivals in NY state in a beautiful setting. The show runs 10-5 daily Saturday and Sunday.